Fly like the mighty Albanian eagle from Adriatic fishing villages to Byzantine towns in Greece and Macedonia. Become an early explorer of Eastern Europe’s last emergent democracy, an unspoiled frontier. Hike pristine alpine passages in the “Accursed Mountains.” Walk in the footsteps of the Illyrians, Venetians and Ottomans through forgotten archeological ruins to discover how ancient civilizations inform the art and architecture of this tiny Balkan wonderland. Embrace modern secular Albania, a rapidly developing country where Islam and Christianity coexist, Mercedes share the road with donkey carts and expressions of cultural diversity transcend national borders. Connect deeply with the citizens of a mystical land described both in the poetry of Virgil and the award winning novels of Ismail Kadare. Touch down at Mother Teresa International Airport in the colorful capital of Tirana. Practice survival language skills, visit the Et’hem Beu Mosque, learn about the transition from communism to democracy, explore the Ottoman era Kruja Castle in historic Skanderbeg and hike into the depths of Shpelle e Zezë, once a troglodyte dwelling for middle Paleolithic humans. Next, travel to Albania’s eastern frontier to learn about the impact of Byzantine and post-Byzantine civilizations on the art, architecture and people of eastern Albania, western Macedonia and northern Greece. Visit UNESCO World Heritage sites, attend lectures about ethnic minorities and explore villages untouched by time. 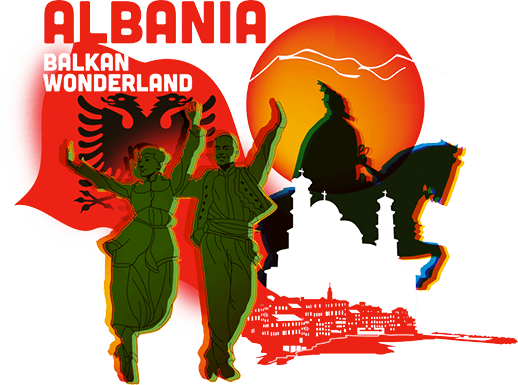 Then, live with an Albanian family to learn about family life and traditions. Explore local markets, learn traditional dances and cook fresh bukë gruri. Head north to the stunning Albanian Alps to hike remote alpine paths, visit tribal villages and eat home-cooked meals in mountain guesthouses. Your Albanian adventure wraps up on the soft sand beaches of the Adriatic Sea, sampling fresh seafood and swimming in crystal blue waters before returning to Tirana and your flight home. Visit the 18th century Et’hem Beu Ottoman Mosque. Meet with Albanian students at a local youth center. Learn from spiritual leaders at the world headquarters of the Bektashi Order. Spelunk in the Caves of Pellumbas. Hike through the Kruja Castle and Bazaar in the town of Skanderbeg. Praktikë për të folur gjuhën Shqipe në tregjet e Tiranës. Learn about Byzantine and post-Byzantine art and architecture. Cross international borders into Greece and Macedonia. Explore connections between history, culture and geography. Become part of an Albanian family. Develop your Albanian language skills over meals of gjellë and chilled tarator. Learn traditional songs and dances. Visit Gjirokastër, a well-preserved Ottoman town on the banks of the Drino River before heading North. Hike through Albanian mountain hamlets. Take in the snow-capped peaks near Boga and QafeThores. Spend a few days on quiet Adriatic beaches. Return to Tirana for a final meal and discussion about re-entry before the journey home.